Look Who's The Fabulous Friend on Friday!!! Meet Daniela Shuffler of Aesthetic Oiseau ! My fabulous friend lives in Alexandria, Virginia with her husband Carter. She started Aesthetic Oiseau in September of 2009. If you aren't familiar with her blog, you must pop over and visit! I am sure it will become a daily read once you do! Named one of D.C's best blogs by the Washingtonian, Aesthetic Oiseau is a blend of DIY projects, great resources, inspiration and an occasional peek at Daniela's own home's renovations. I have been reading her blog so long, I feel like I know all about Daniela, but I didn't meet her until the Blogfest 2012 kick off party at the the Kips Bay Show House in April of this year. We bumped into each other in one of the rooms and I immediately recognized her beautiful face! After introductions, I told her how much I enjoyed reading her blog. It was no surprise, that she was as charming in person, as she seems on her blog! As we were chatted she mentioned her "husband" and I said you mean "Carter" which brought laughter! She said, "oh yeah, I forgot you read my blog!" At that initial meeting I realized we were kindred spirits. There were many fun days in New York in groups talking about blogging, life and everything in between. As we were leaving the Kravet showroom,where we were treated to a sumptuous lunch, some of the us picked up Traditional Homes Magazines on the way out the door. I handed one Daniela's way to which she responded, "oh, I don't need one, as Carter's Grandmother would say I already "take" that magazine. Carter 's Grandmother is from Charleston,SC, so she is a southern woman like me! I couldn't help but laugh. It never occurred to me that "taking" a magazine sounded odd, because where I grew up, everyone "took" magazines! We all laughed and I added a little "bless her heart" for "good measure" as we departed for our next adventure! I will always treasure that trip to New York, because I have met so many wonderful people thru blogging like Daniela. Looking back on our trip to New York, It's only natural that I would choose Daniela to be one of my Fabulous Friends on Friday, because she was one of the people that I had anticipated meeting on my trip! 2) What was your first job? I studied communications in grad school so my first job was for a journalists' membership association in DC doing PR and communications. It was a great first job because it exposed me to web design and graphic design, which has led me to my fabulous job today. 3) What prompted you to start your blog? Also, how did you choose the name of your blog? As all bloggers can say, I'm design obsessed and constantly have ideas/wish lists/projects going either in real life or in my head. Carter and I had just purchased our home and leading up to the purchase I was completely immersed in design blogs for inspiration. Once we actuallymoved in, I realized that a blog would be the perfect place to catalog ideas for myself as well as show off the house progress (we did lots of renovation) to friends and family. And since I'm a web designer, working in an online medium was completely comfortable and the natural place to put my thoughts. Actually starting the blog was an impulse one night while I watched TV, which also explains my very impulsive, nonsensical blog name. "Aesthetic Oiseau" just seemed to roll of the tongue that evening. Didn't realize that most people don't know how to pronounce or spell it - oh well! 4) Do you have any advice for anyone who wants to start a blog? You absolutely, 100% MUST be passionate about your subject. It's the Golden Rule. Those without passion lose steam. You have to have enough material going in on your brain to keep a blog running and to enjoy doing it. If not, you start recycling materials others are putting out there and you lose your voice. I also think that you are doomed for failure if you constantly compare yourself to others or other blogs. Blogs are about you and your own voice, so once the comparisons start it can lead you down a tricky road that can make your blog become a chore. Be passionate and unique!! 5) Has it been more work than you thought? It hasn't really been more work because I haven't let it turn into more work. In a way, I wish I dedicated more time to it because I think I could really turn it into something "big" (relatively speaking for me). But, I also think that putting more effort into it may cause me to start dreading it a bit. Right now, it's a perfect commitment for me. I really enjoy writing my short posts every day and it has brought me lots of wonderful opportunities and I've met great people so I feel like my work is paying off in ways that make me happy. 6) You work in graphic design, how does that relate to interior design? Oh man, my worlds are CONSTANTLY intertwined. 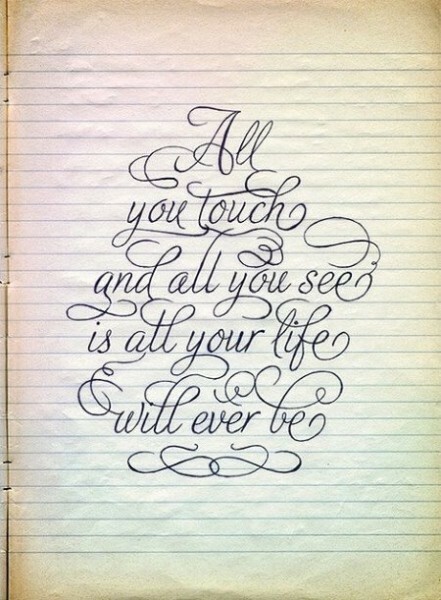 I am so incredibly lucky that literally from the moment I wake to the moment I go to sleep, my world is full of design! I can't get enough so it works for me. I always see things in interior design that I like to incorporate into my graphics, or vice versa. My day job is a wee bit different because I work a lot in User Interface design, which is just a fancy way of saying functional web design, but I still translate everything I do into a visual experience both at home, with clients, and at work. 6) Do you think design is an art or a science? Design is an art for me - it comes from within and I never have a formula. 7) What inspires you? Fabric! In terms of interior design, that is always where I start. A fabric can get my mind racing with a million ideas - it's a great feeling. I also get really inspired by shopping...seeing things in person, seeing their colors, seeing their scale...always whips up ideas in my head for blog posts, for rooms, for party themes. My favorite shops are vintage and consignment shops. 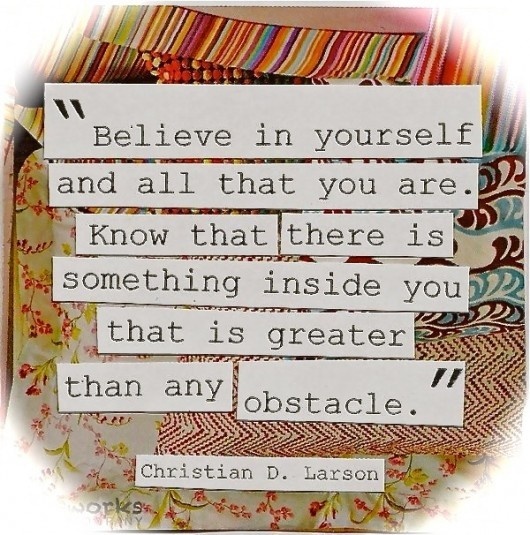 8) You are renovating your first home, what has been your biggest obstacle? for him to do the impossible - we still have that stain in our home. 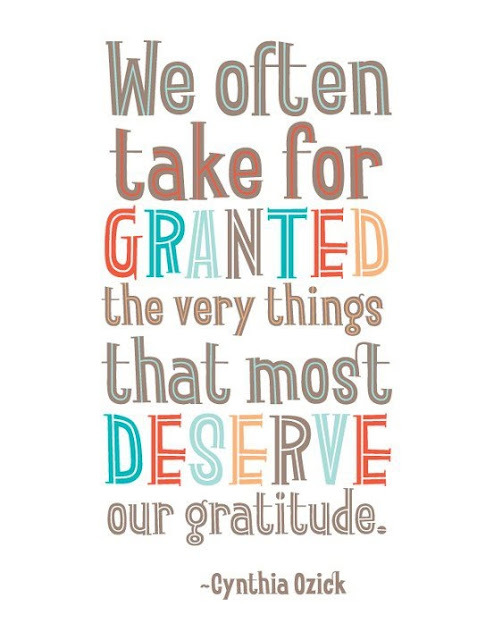 9) What have you found most rewarding? I absolutely love our home, because we've created it with our own hands and to our style, but I think there are so many "mistakes" I made just because I didn't know what I was doing. Nothing major...but now having a little experience, I would jazz up some areas. Having said that, I'm pretty impressed with what we've accomplished having been first-timers...and I owe most of that to Carter because he makes all of my visions come to life. 11) If you could invite 3 people to dinner who would you invite? My grandmother and my aunt - both deceased and boy would I love one more dinner with them. And my sister can tag along too. 12) If you had an unlimited budget, what you go out a buy? Probably a dream home and have it renovated (b/c it would be old) from top to bottom exactly how I want it and I would hire all of the work out! I would use all of the Schumacher, Brunschwig and Quadrille fabrics and wallpaper I want! I would also hire a stylist and have a total wardrobe revamp because I'm really sick of my clothes these days. 13) Where do you see yourself 10 years from now? I would really love to be working for myself in my own creative studio offering design in my favorite formats - web, graphic and interiors. That would be at total dream and it would be even better if it was a family business that Carter was involved in as well. He's so great at home renovation - I'd love to see him pursue that and dovetail it with my love of interior design. Our family will likely be complete by then, so I also want the freedom of owning my own business in order to enjoy my time with my kids, my family, and my friends as much as possible. 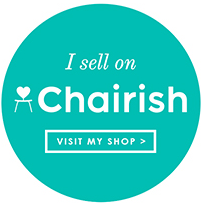 Maybe I'll own a shop -that's a possibility too! Now you know why she is a Fabulous Friend! to answer all my questions! I can promise you will fall in love with her too! This is a Sponsored post written by me on behalf of éclos Skin Care. Recently I was approached by éclos Skin Care Skincare review their products. I had never heard of this plant based anti-aging skin care, so to say I was curious is an understatement. éclos Skin Care sent a kit for my own use and one to give away to one of my readers. I originally planned to use the skincare for a week, but I liked the system so much I used the products until empty! I have always used quality skincare on my face morning and night, so I am familar with products that give good results. This product was different than most of the medical grade systems I have used in the past. éclos Skin Care features Apple Stem Cells extracted from a rare Swiss apple which have shown tremendous ability to stimulate skin stem cells. This encourages aging skin to behave like younger skin. Anti-oxidants plant extracts, vitamins combine with the Apple Cell technology to help reduce the appearance of wrinkles, fine lines and give the skin a youthful glow. I can truly say I was pleasantly surprised by the results I received. My skin was softer, clearer and lines were less visible. I loved the clean smell of the products and the fact that it is all natural. There are no parabens, sulfates, synthetic fragrance, synthetic dyes or petro-chemicals. In addition to the Plant Stem Cell technology, éclos Skin Care is enriched with PhytoPlex24, aproprietary complex of plan extracts, vitamins, and anti-oxidants. I am all for anything that gives results without chemicals! -Moisture Therapy Regenerative Cream- Protects your own skin stem cells and promotes self renewal of the skin while slowing the signs of aging. -Instant Radiance Facial Scrub-The microdermabrasion properities found in this scrub help polish away dry flaky skin while smoothing fine lines and wrinkles to improve the overall texture of the skin. -Skin Renewal Clay Mask- This multifunctional mask cleanses, absorbs impurities and un-clogs pores while helping to restore skin to its youthful prime! The kit is valued at $19.99 which is an unbelievable price considering the cost of similar products offered at depatment stores. While I don't typically do paid post on my blog, I liked this product so much, I would like to give one away to my readers! If you are interested in trying éclos Skin Care starter kit, like Eclos on Facebook and leave me a comment below telling me which product you would be most excited about trying!!! After all, we all want to look younger don't we? If we can't actually turn back the hands of time, at least we can look like we did with the help of éclos Skin Care! 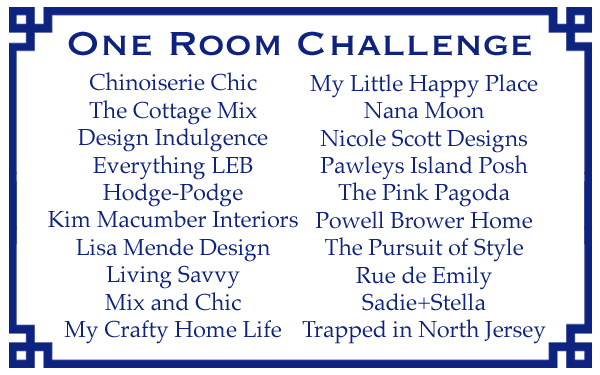 Week #1 of The One Room Challenge! Join the summer fun, while twenty interior designers/bloggers and I put our design talents to the test transforming a room of our choice. Yes, that's right, while the rest of you are sipping margaritas by the pool, we will be choosing fabrics, paints and wallpaper to create a dream space! Each participate has selects a room in their own home or a client's and has six weeks to redo it. There will be posts each Wednesday at a minimum, but each blogger has the option to do as many posts as they like. If you are not one of my subscribers, now is the perfect time to sign up so you won't miss out on these fun transformations! Thanks to our organizer Linda of My Crafty Home Life and our graphic artist Jennifer of The Pink Pagoda. A extra special thanks to Jennifer for suggesting I be included in the challenge! Below is the list of all the participates. At the bottom of this post is a link to their blogs. Make sure you check out each participate to get really great ideas for your own house! We will share DIY tips, paint choices, fabric selections and other fun little secrets and tidbits you don't want to miss. The Room I have chosen to do is a client's family room! Here are some before pics! Sorry, I failed to get a full view of the room and since I am 2 hrs from the project, don't think that is going to happen! So I drew a quick sketch of the floor plan to give you an idea of the space with the existing furniture. Here is a photo of the left side of the room. This gives you an idea of what the room currently looks like. The walls are Sherwin Williams Muslin. Drapery panels are from Pier One. This is a second home and the client moved in rather quickly, so she put things in the room to have somewhere to sit and something to cover the windows temporarily until she could get the room designed the way she wanted. She wish list is to redesign the entire space and pick a deeper paint color, possibly furnishings, fabrics and accessories. This art is hanging on the opposite side of the fireplace from the photo above. To give you an better visual, there is a cabinet below this piece of art identical to the cabinet in the first photo so the fireplace is flanked by those cabinets with the each piece of art hanging above the cabinets. This is the existing rug. 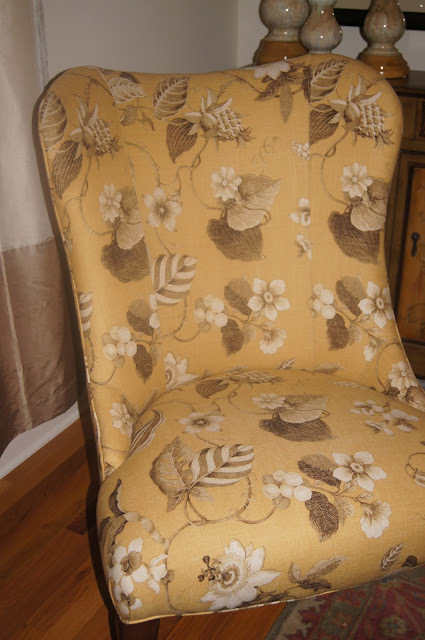 As you can see the chair is a flax colored linen club chair. Again, sorry no pic. Also did not get a picture of the sofa but it is olive tweed and is 91" long. It is sitting facing the fireplace with the floral chair on the left side side and the linen chair on the right of the fireplace. This is the breakfast area in the kitchen. Since the kitchen/breakfast room are open to the family room, I decided to treat it as one room. This is the kitchen. We plan to do a couple of things in there as well. I can't wait to get started on this project! After I throughly interview my client, and take inventory of the room, we will decide together what she wants to keep to work with and what can go. We will look at the existing floor plan, to see how the flow has worked for the client, then discuss other options. 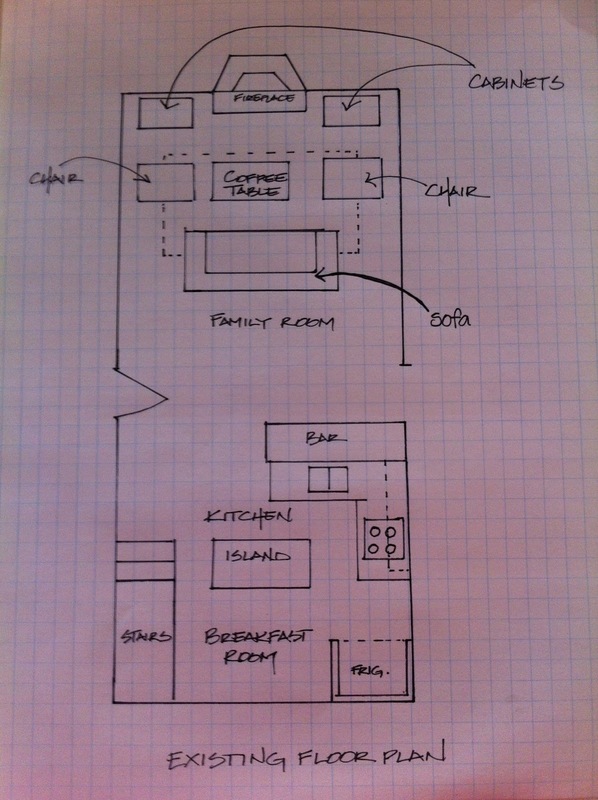 Next, I will do a layout of the space on graph paper and plan the best layout for the room. I have a feeling we will be making some changes. After we space plan, we will begin choosing furniture, fabrics and paint colors!!! It's going to be so exciting!!!! I hope you will come back each week to see our progress!!! 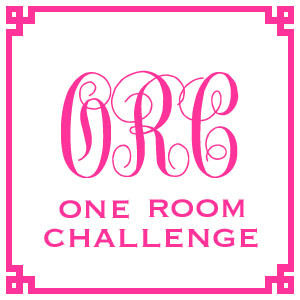 This is a list of all the participates in The One Room Challenge! Please check out their blogs to see their rooms! 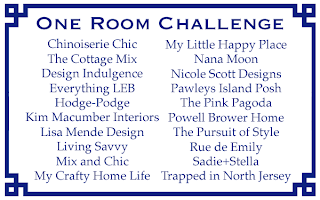 Week One- One Room Challenge Coming!!!! Coming this afternoon! Check Back!!!! Making Beautiful and Younger Skin Available to Women Everywhere! #EclosBeauty! are good options out there for a variety of budgets. The trick is to use trade secrets to making the ready mades look custom. First, let's discuss places to buy ready mades options. Restoration Hardware offers some good options. Their drapery are made from good quality fabrics and are available in many different fabrics from sheers and burlaps to silks. Their styles range from rod pockets, which are the cheapest to french pleats, which are the most expensive and some options in between. The colors available are based on paint colors, that have proven to be popular, so typically you can find something that will work for your room. 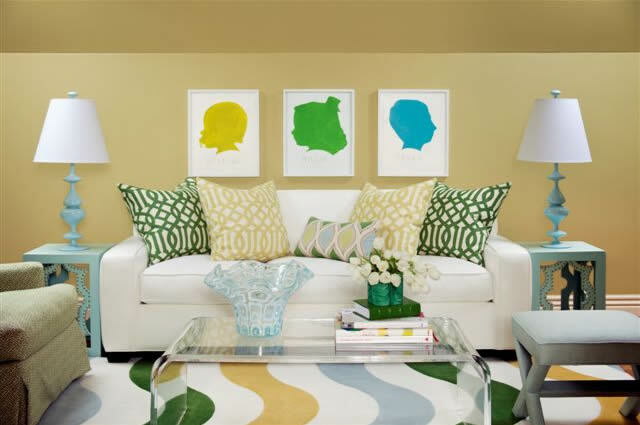 Most of their options are solids or tone on tone, but there are a few stripes in the mix. 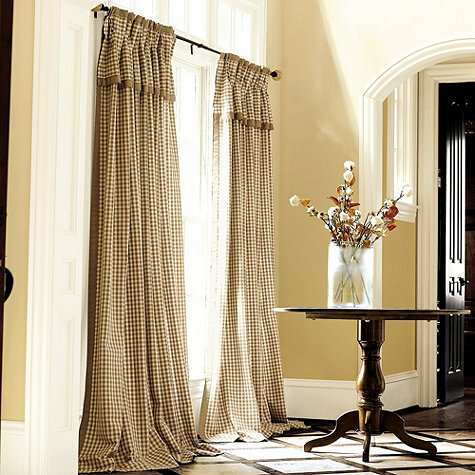 Pottery Barn also offers some good options for ready made window treatments. 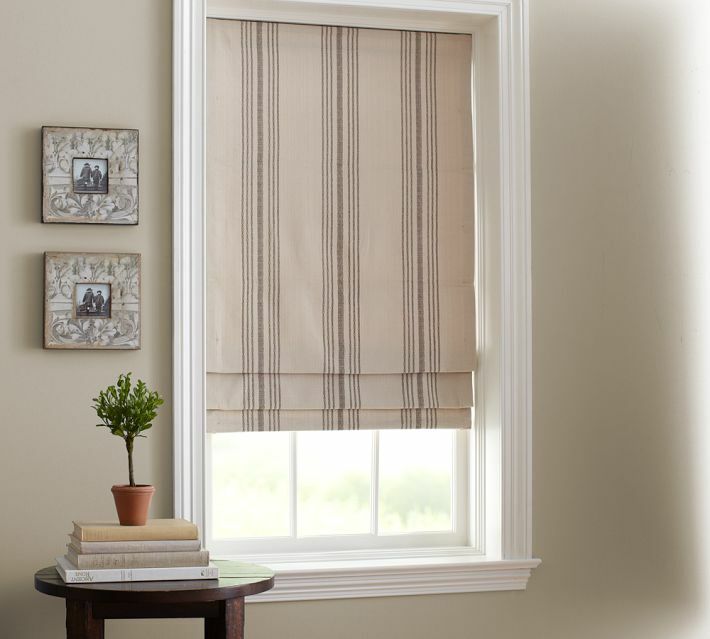 They also offer blinds in a variety of fabrics as well. Unlike Restoration Hardware, Pottery Barn offers prints. Like Restoration Hardware, their fabrics are nice and seem to be well made. 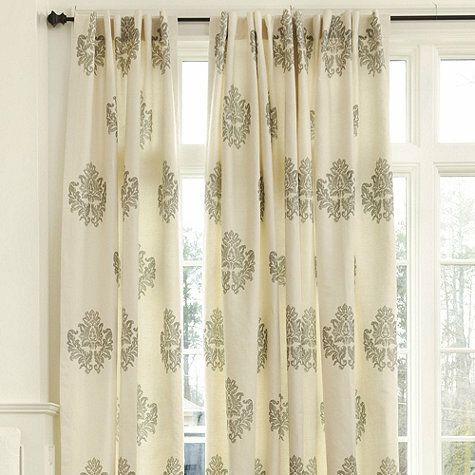 Ballard Design also offers well made options in a variety of fabric options and styles. Their drapery range from very traditional to updated options would work in a variety of rooms. I think it helps to see the drapery hanging in a room to give you a visual of what the product actually looks like in a space. I especially like the options available from The Shade Store's Robert Allen Collection. Let's face it, Robert Allen fabrics are really great and the options are endless. If you can't find one here that works you aren't trying. that I am not even listing. them from looking ready made? First of all, you must measure properly for your window treatments. 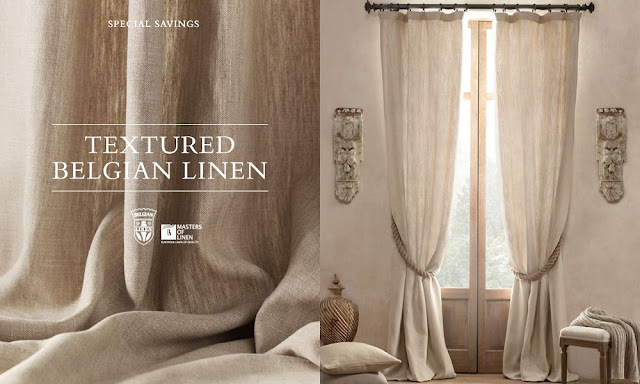 Most companies selling ready made window treatments, give directions for measuring on their websites if not you can call them or google how to measure. Getting the measurement of your window is the first place to start. There are issues they don't mention that can make a world of difference in the finished look of your window treatment. Let's discuss these issues first, because they must be considered before ordering your panels. 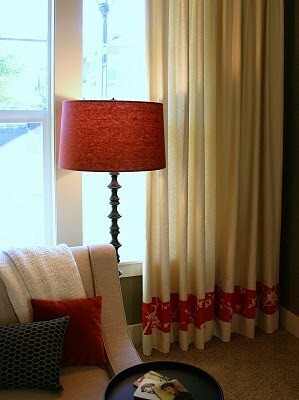 1) Want to make that window treatment look custom? Don't skimp on the fabric. Once you measure your window's width, let's say your window is 100" wide. Do you need a drapery that will cover 100"? 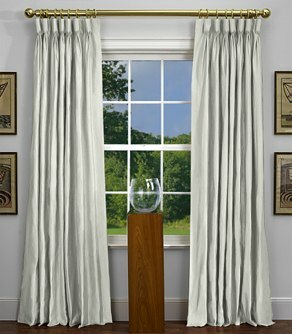 Did you know a custom workroom typically measure a window and then either multiplies by 1 1/2 or 2 times the width of the window to determine how much fabric to use? Taking this into consideration will mean not just "covering" the window. There is nothing worse than a thinly made drapery panel stretched across a window. (Cheap!) Consider using double the amount of panels you think you need. If the company you are purchasing from offers double width panels, this is best, but if not, buy double width and sew the two panels together to get the fullness needed. 2) Consider your stack back space. What is stack back? 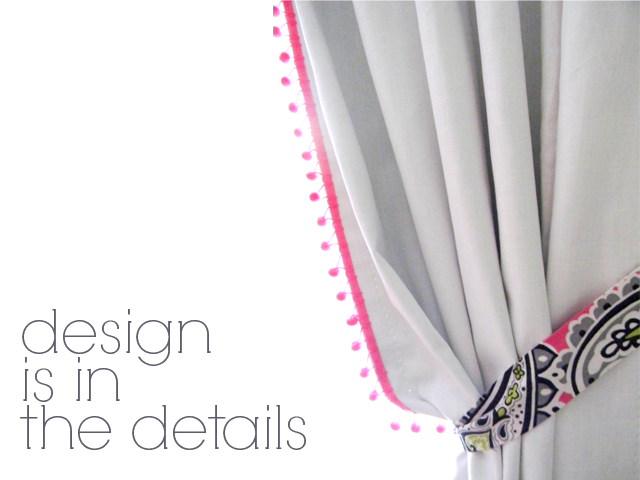 It is the wall on either side of your window where your drapery can hang. Click here for a couple of standard stack back formulas. This is a guide but you can vary depending on preferences. Stack back makes the window appear larger, which can create a great illusion, especially in a breakfast room or bedroom, allowing more light into the room. Make sure you take the stack back into account when ordering your rods. Again, no skimping! 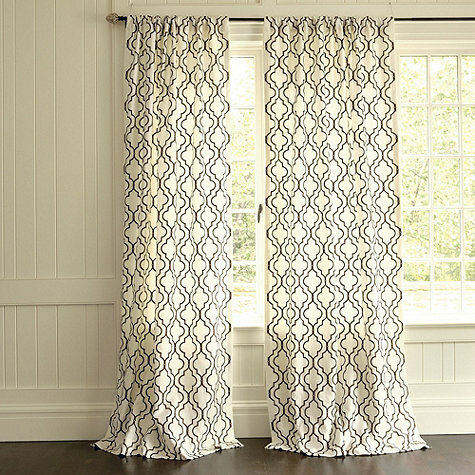 3) Rod Pockets do not belong in living rooms, dining rooms or any space you want your drapery to look really professional! The panel below is made just like the one above, but instead of just running the rod pocket on the panel, they used the hidden tabs on the back. (Ballard offers the hidden tabs on some of their panels) If you panel doesn't have the hidden tabs, you can get this look by buying drapery rings and hooks. You simply attach the hooks on the back of the panel and hook through the rings. It is amazing how this will make your panels hang better and look more custom. the clips look a little dressier and more traditional. 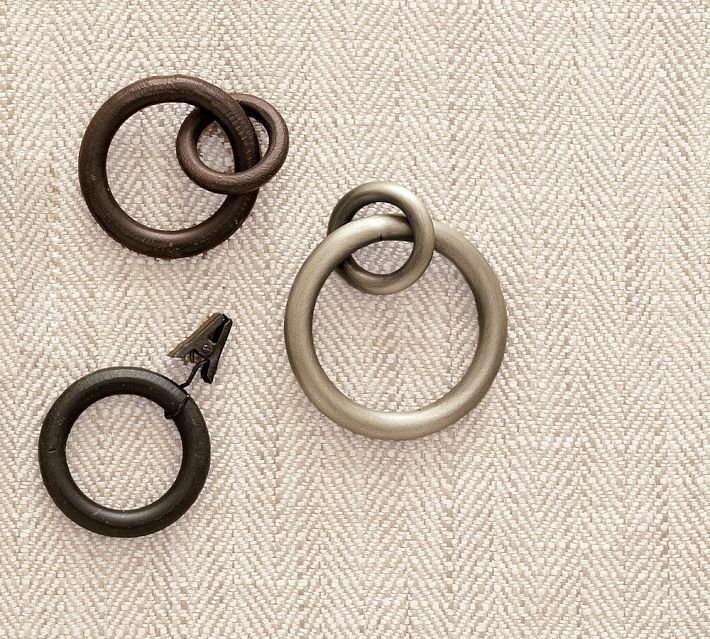 These are the drapery hooks you attach to the panel if using the rings without hooks. They are attached on the backside of the panel so they are not visible. 4) Make sure your drapery rods will hold your panels. If you buy heavy panels, make sure your drapery rods will hold them! Nothing is worse than having a dinky rod that is weighed down in the middle. If you have to buy extra brackets to re-enforce your rods, do it! Nothing is worse than high water drapery, floating mid-way your wall! Again, take into consideration where you want your panels to hang. If you want them to be wall mounted or trim mounted, if you want them 4" above the trim or 6", also what type of rod and ring you are using. Do the Math! Add all these together. 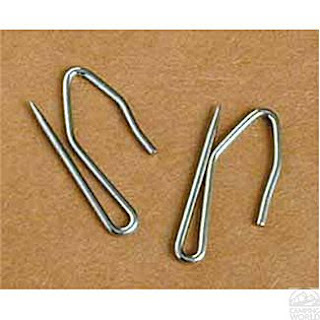 If you are using holdbacks add 4" to the overall finished length. You might think you need 90" panels, when actually you need 108"
I know I said above to decide if you want wall mount or trim mount but actually I feel that there is only one way....Wall mount! Don't you want those windows to feel taller? I am a big fan of mounting as high up as you can, especially if you have 8' or 9' ceilings. Of course this changes if you have vaulted ceilings or really tall ceilings. Look at your windows and decide how high you can go, then add the inches to the equation. 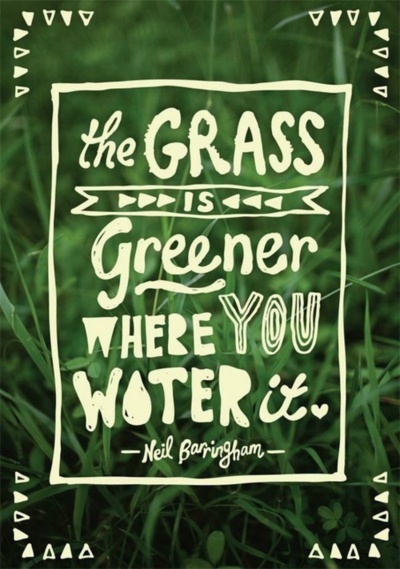 You will be happy with the results. Adding a trim, fringe, braid or band of fabric to the edge of your panel will instantly elevate your ready made to custom level. No longer are you staring at a plain panel that anyone can purchase. You suddenly have something that co-ordinates with the rest of your room and fabrics. You can be creative with this too. 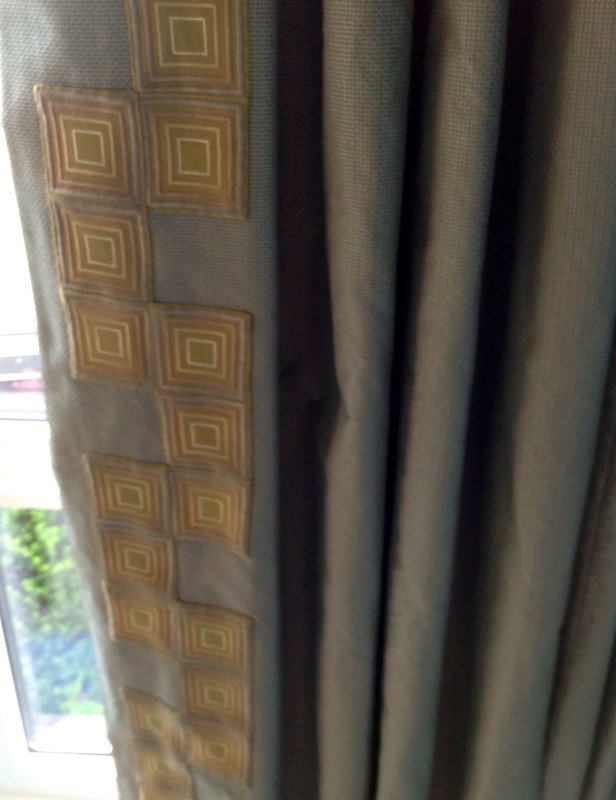 If you want, you can paint a border on or cut fabric apart as the designer did below on the panel shown. Trim added at the bottom of the panel. This can also work if you happen to buy panels that are not long enough. You can always cut the bottom off the panel and insert a band of fabric to length the panel while also making the panel look custom by matching other fabrics in the room. Ball fringe and paisley tie backs were added to make these ready made panels perfect for a little girl's room. it is possible to get a custom look even with Target drapery. The secret is to following tricks of the trade. Have you used ready made panels? Any tricks you care to share? 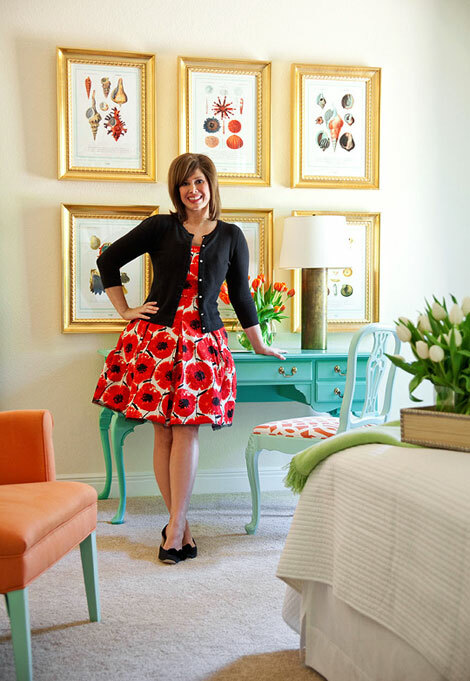 Name One of Traditional Homes "Top 20 Young American Designers 2009"
Some of Tobi's beautiful work! 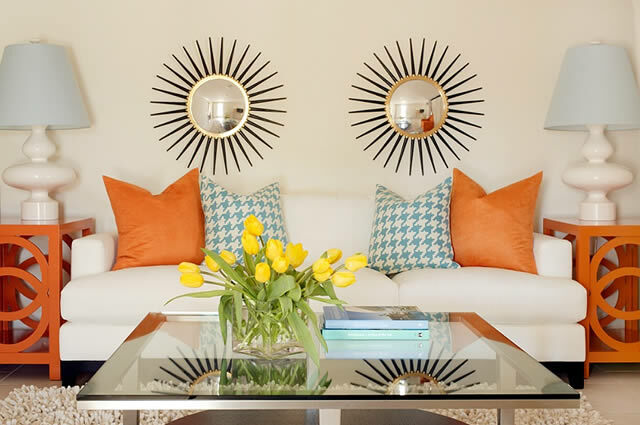 I originally found Tobi Fairley's blog in 2009 and was immediately drawn to her interior design style and bold use of color. Interestingly, I was going through a very dark period of my life, after having lost a child and I was looking for any ray of sunshine to brighten my dreary days. Tobi's work conveyed a feeling of warmth and happiness, which I so desired in my life that that time. One Friday night, after reading Tobi's blog post, I posted a comment on her blog. She almost immediately responded to the comment. I was really impressed. Someone who was just named one of Traditional Homes Top 20 Young American Designers of 2009, would take the time to respond to me? That email was the beginning of a regular email dialogue between Tobi and myself. Our email conversations ranged from everything about Tobi's daughter, Ellison's soccer to my struggles to get back to my interior design practice. Each email always ended with a strong note of encouragement from Tobi. Her desire to lift me up, really touched me. Like me, Tobi was a working mother, who was passionate about her work, yet she still seemed able to keep her life priorities in order, mine seen to have gotten caught up in life. Over the past two years, Tobi invited me to come to her design camps, MBA groups and Mastermind. I always knew I would eventually go, but the timing had to be right. She didn't give up on me, she periodically sent me an email asking how I was and when I was going to come. She became my lifeline. Tobi would say "you have to just start Lisa. It will happen, but you can't sit around and wait for it to happen, you have to make it happen." 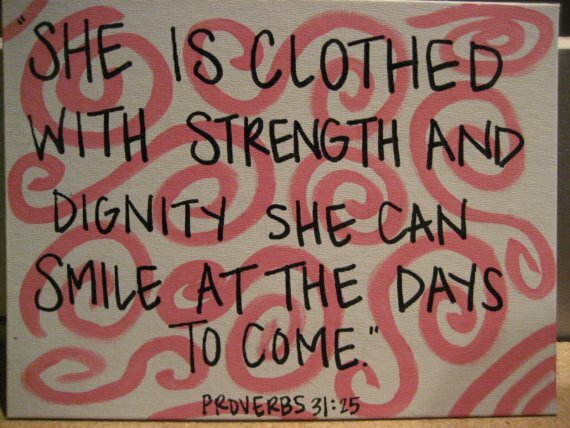 The most monumental statement she made to me was "I will do everything to help you!" Wow! Here is a designer I have gotten to know through commenting on a blog post, who had taken a genuine interest in me. How could I not take notice? If you are in the industry, you know this is not the norm, many designers are guarded and don't get personal. They could careless if another designer is successful or not. Not Tobi! She didn't have an employee send me an email, she wrote it herself , which is pretty amazing with a schedule like hers! Tobi has been published in almost every major shelter magazine I read. She developed her own line of pillows, fabrics and lighting which debuted in the Fall of 2011 as part of Hickory Chair's Centennial Furniture Collection. 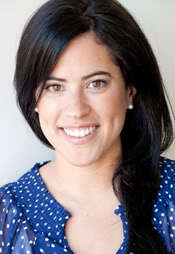 She speaks nationally and has developed Tobi Fairley Consulting Group. Tobi has achieved all the things that most designers dream of doing. Privately, I saw Tobi from another angle. This hugely successful woman, who barely had time to breathe, took time to reach out to me in my time of need. That is the kind of person Tobi Fairley is. That is why she will always be successful in life. She really gets it. She knows what is important and doesn't take life or people for granted. When she asked me to participate in her Mastermind Group, I was both flattered and interested, but not sure the timing was right. Don't get me wrong, it's not an invitation only group, but the mere fact that she reached out to me, touched my heart. I was worried that I was not ready to go back to work or reality. She convinced me otherwise. She made me realize that my life could return to normal, after the death of a child. It was that "believing in me" that put me on a path of returning to myself. Why is Tobi successful? She works extremely hard and doesn't give up on her dreams. Who better to be my mentor, my business coach? As I lovingly said to Tobi recently..."all roads lead back to Tobi" so I joined Mastermind! What I have found from participating in Mastermind, is in order to a success like Tobi, one must be willing to do what it takes to be successful if that means to hit the ground running that's what you have to do. Tobi doesn't mess around! It isn't an accident that she is a success it is a well laid and worked plan. Tobi doesn't sit back on her laurels and let life pass her by, she gets up every morning and plans her day with intention. 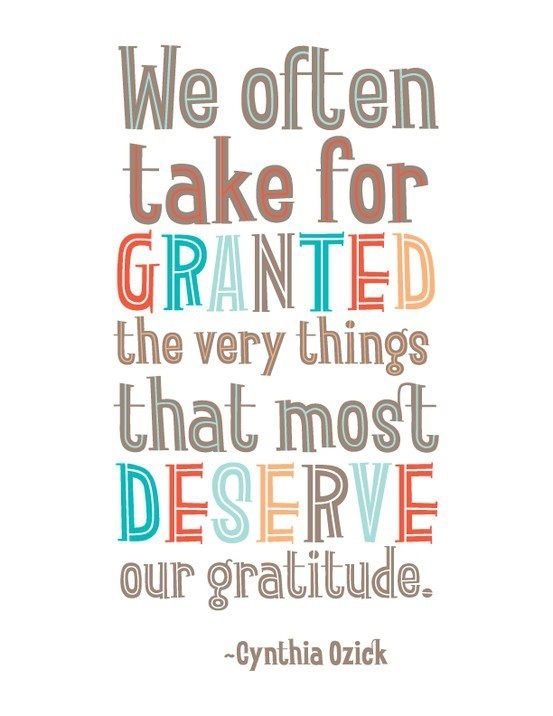 Just being with Tobi makes me want to be a better person at everything I do and for that I am truly grateful! 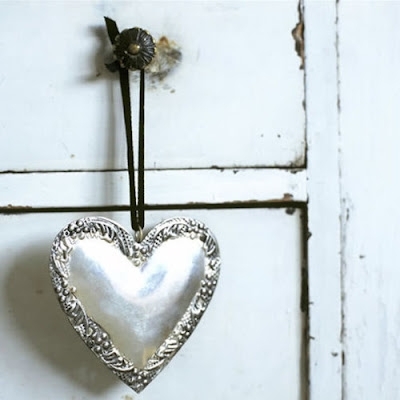 Thanks Tobi for having a heart that I am quite sure is sterling silver and for caring about little ole me! I consider myself lucky to call you my friend! And I can't wait to share more about my first week of Mastermind with you! Built In Coffee Makers...Just Gotta Have It? Elizabeth Moyer on Fabulous Friends on Friday!